Not all dogs, Basenjis or otherwise, are trustworthy in the house alone. Even if your new dog comes with the ‘trustworthy in the house’ label, consider limiting the area in which she is free to run until you are sure the dog fits her description. And even if she proves completely trustworthy, keep in mind that confinement to her ‘safe place’ while alone can reduce anxiety. You may wish to experiment to determine what works best: a crate; area confinement using gates; or an ex-pen. Crates come in many styles, sizes, materials, and prices ranging from plastic to wire to decorative to fabric (we recommend AGAINST fabric crates for Basenjis) as shown here. There are many sizes and styles of gates as well, ranging from functional and sized for a doorway to decorative and expandable to suit an ‘open’ floor plan. Whatever you choose, be able to secure it in place. 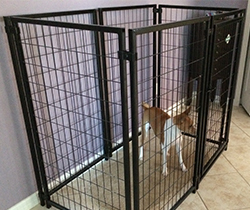 We have observed many Basenjis push through a press-fit gate and require gates that fasten to a wall or door frame. Ex-pens are purely functional and can be used indoors or out. Tops are available to enhance their security like that of a crate. And there are tarps available for protection from the elements during outdoor use. Click here for examples. If you have a deck or porch, consider installing a gate to eliminate the possibility of your besty bolting out into the yard–or beyond into the street! And remember that some Basenjis are jumpers–railings of a deck or a porch may be too low to provide sure confinement. Finally, recognize you may even need to gate your front door to prevent an ‘escape artist’ from bolting.